After a long day of cooking and cleaning, Papa, Mama, Hannah, and Noah Sheep are all ready for Passover seder in And Then Another Sheep Turned Up. But just as they re about to sit down and begin, Grandma Sheep shows up! She s not the only unexpected guest that arrives during the seder, as Uncle Sol, Grandpa, Danny and Sharon, and finally Aunt Deb all join the celebration. 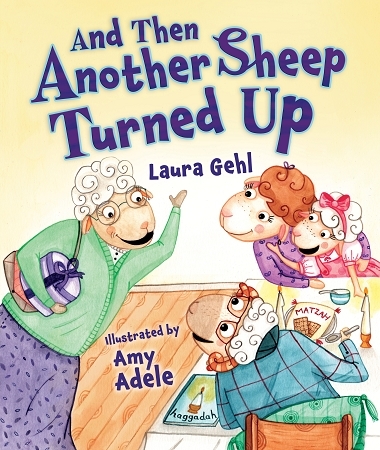 Told in buoyant rhyme, this newest Passover story from Kar-Ben includes all the most important parts of a Passover seder while telling the story of the Sheep family s surprising evening! "An amusing and appealing way to enlist little ones in the holiday's rituals." "their affection for one another is evident: just as the Sheeps never run out of food despite the growing guest list, they likewise possess an endless supply of hugs and smiles."